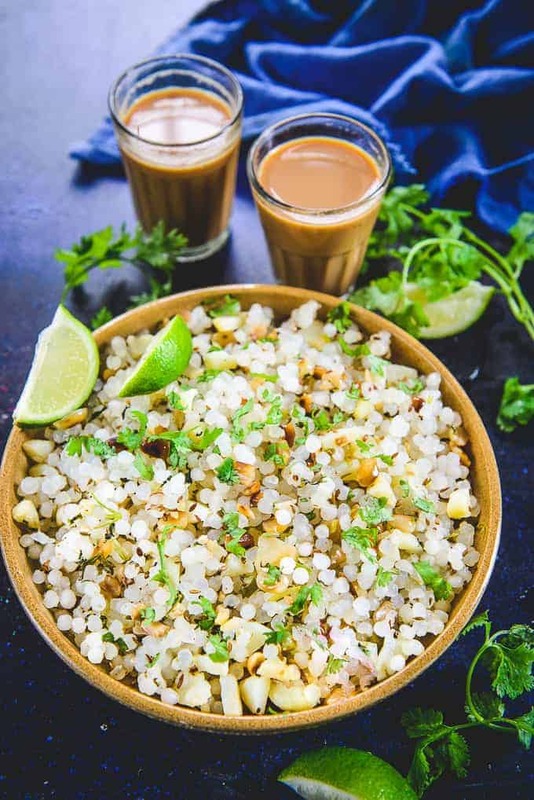 Sabudana Khichdi is a traditional Indian breakfast recipe which is made using sago pearls. You can make thsi vegan and gluten free dish for breakfast or any time of the day and enjoy. Follow my tips to make the Sabudana Khichdi non sticky. Here is how to make Sabudana Khichdi Recipe (For Vrat and for Regular Eating). Kichdi is a very famous Indian dish made by cooking lentils with rice. But nowadays, there are so many different varieties of khichdi available. Today I’m going to present to you a khichdi made using sago or tapioca pearls, popularly known as sabudana in India. Sabudana is a very popular ingredient that is used in many dishes, especially during the fasting (Vrat) season when grains are not prepared. 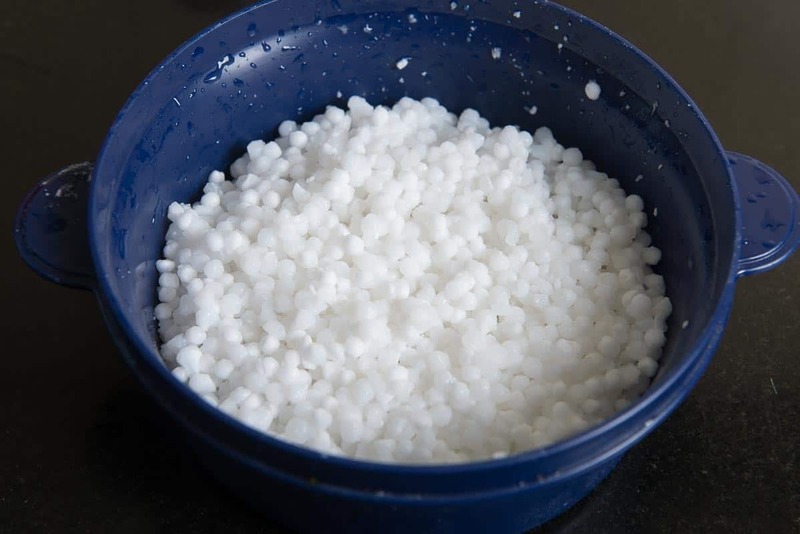 It is called Sago or Tapioca Pearls in english. Made using Cassava roots, a form of tapioca, sabudana is basically the starch extracted from the rots of tapioca. It is a good source of carbohydrates and is used in recipes like Sabudana Vada Pancakes, Aloo Sabudana, Sabudana Thalipeeth and a delicious Sabudana Vada. It is also an ingredient in Bubble Tea and fruit slash. The reason this kichdi has become a quintessential dish during this season is due to its high starch content. Navaratas will not be complete without Sabudana Khichdi. It’s very important that you get the consistency of this dish right; you must ensure that the sago doesn’t become too sticky. Make sure to wash the sabudana 3-4 times until the water becomes clear and is no more milky. Soak the sabudana in only 1/2 cup water and leave it aside for 5-6 hours. You can soak it at night before sleeping and use in the morning. Do not over cook the sabudana. Just cook until it becomes translucent. You can use sendha namak or rock salt if you are making it for vrat. Traditionally peanuts are added to Sabudana Khichdi, but you can add cashew nuts or almonds as well. 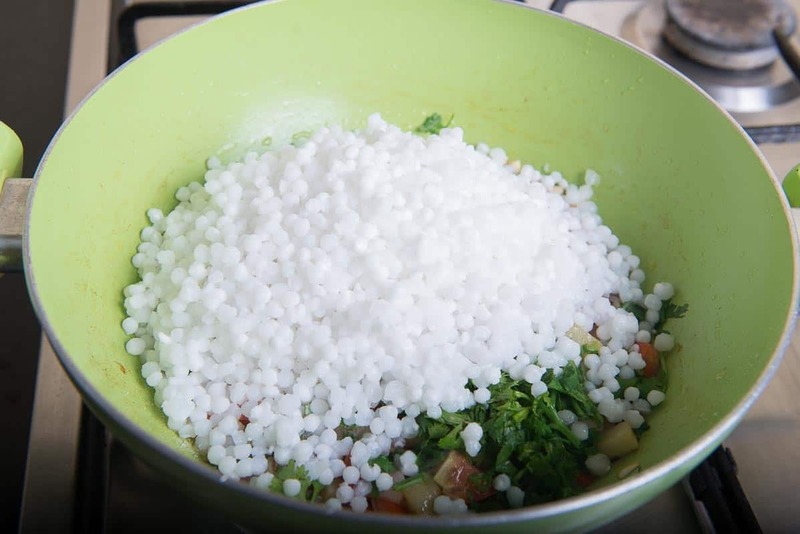 To make this Spicy Sabudana Khichdi first the sabudana or tapioca pearls are to be washed a few times in order to prevent them from sticking to each other. The sago is then soaked in water for about 5-6 hours; just check it once in a while to see that it’s not sticking to each other. 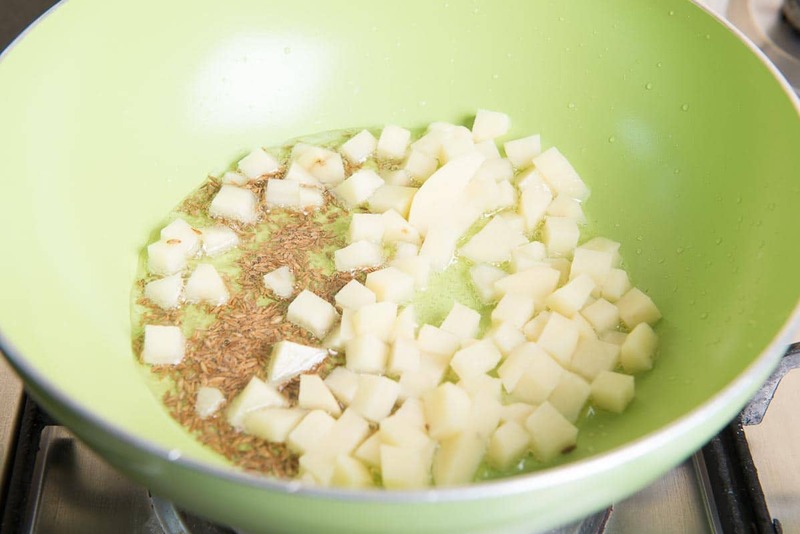 Then the oil or ghee is heated in a pan, to this cumin seeds are added and allowed to crackle, followed by the addition of potatoes. It’s covered and the potatoes are allowed to cook in low heat. 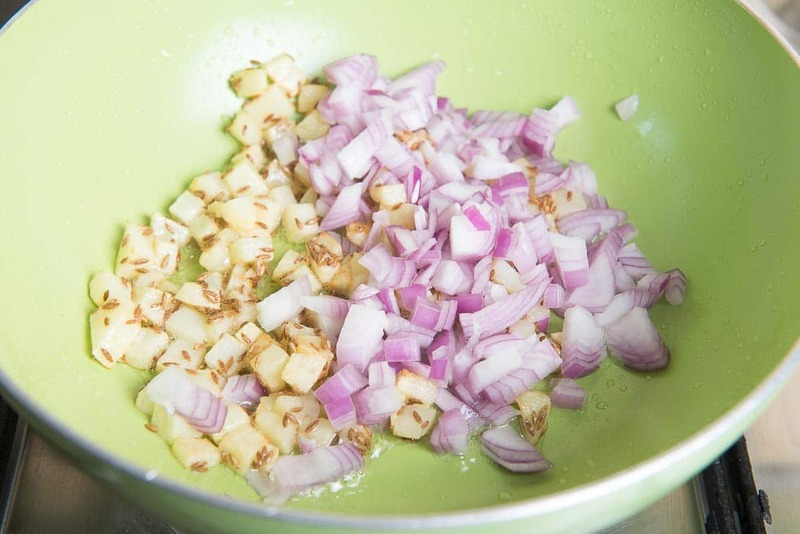 Then the onions are added and fried till translucent. Next, tomatoes and chopped green chillies are added and cooked for a few minutes. Finally, peanuts, turmeric powder, soaked sabudana, coriander and salt are put in. The sabudana is cooked till translucent; it’s important to ensure that it’s not overcooked. 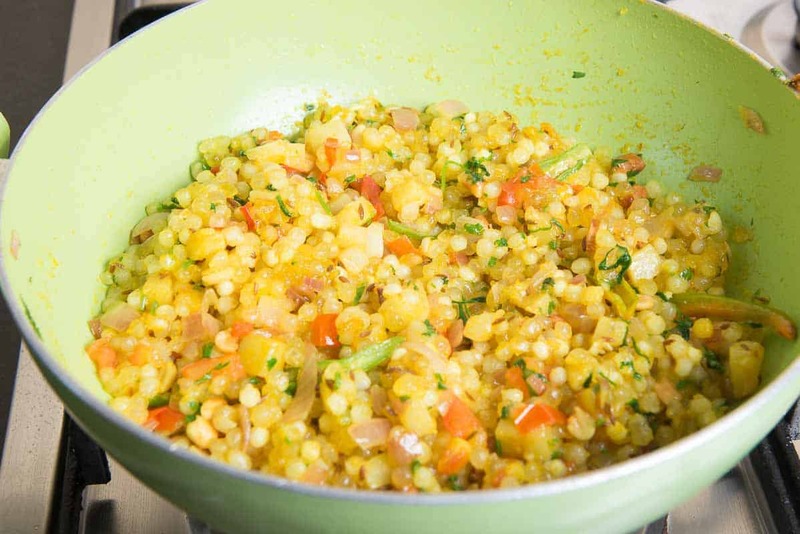 A spritz of freshly squeezed lemon juice is added to the Spicy Sabudana Khichdi and it is garnished with some chopped coriander. This spicy sabudana khichdi is great for breakfast, lunch or even as an evening snack. Sabudana khichdi is light on the stomach but keeps you going for some time due to its high energy content. This recipe needs some planning as you’ll have to soak the sabudana for a few hours, but that’s about it, once soaked, this spicy sabudana khichdi is really simple to make. Pro Tip – Instead of soaking the sabudana in water, try soaking it in thin buttermilk. It will elevate the taste a lot. 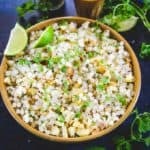 What to serve with sabudana Khichdi? Sabudana khichdi is a full meal in itself and can be served on it’s own. You can pair it with fresh curd or kadhi. It also goes well with coconut chutney or tomato chutney or any raita. If making it for vrat, you can serve it with Rajgira Kadhi. Wash the sabudana 3-4 times. Soak it in 3/4 cup water for 5-6 hours. When the ghee is hot, add cumin seeds. When the seeds starts crackling, add potato and green chillies. Cover and cook on low heat till potatoes are done. Add peanuts, soaked sabudana, coriander and salt. Cover and cook on low heat till sabudana turns translucent. Add lemon juice. 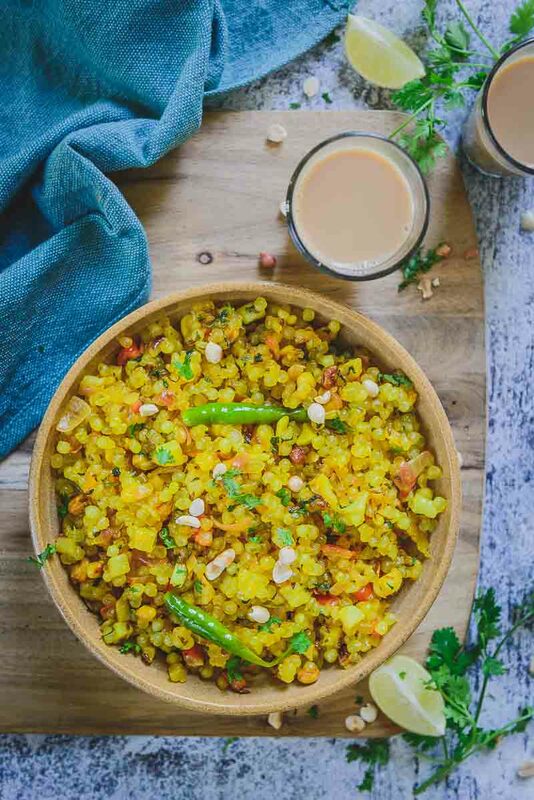 Sabudana Khichdi is a slightly different version of the traditional no onion sabudana khichdi which can be had for breakfast or evening snacks any day. Cover and cook on low heat till sabudana turns translucent. Wash the sabudana 3-4 times. ( This will keep it from sticking and the pearls will be separate after cooking ) Soak it in 3/4 cup water for 5-6 hours. 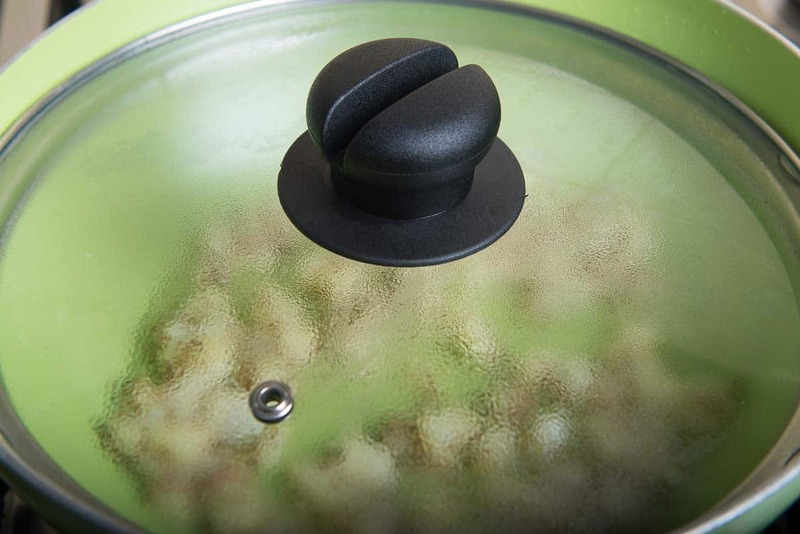 Heat oil or ghee in a pan. 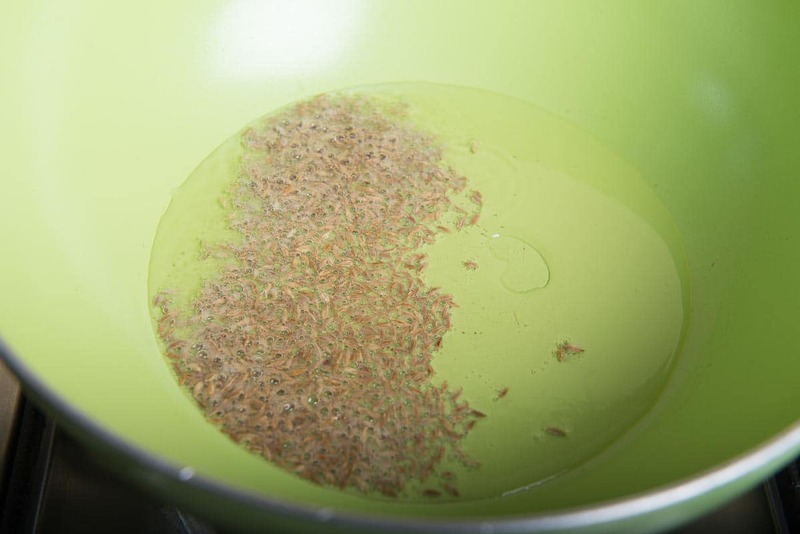 When the oil is hot, add cumin seeds. When the seeds starts crackling, add potato. Add onion and fry until they turn translucent. 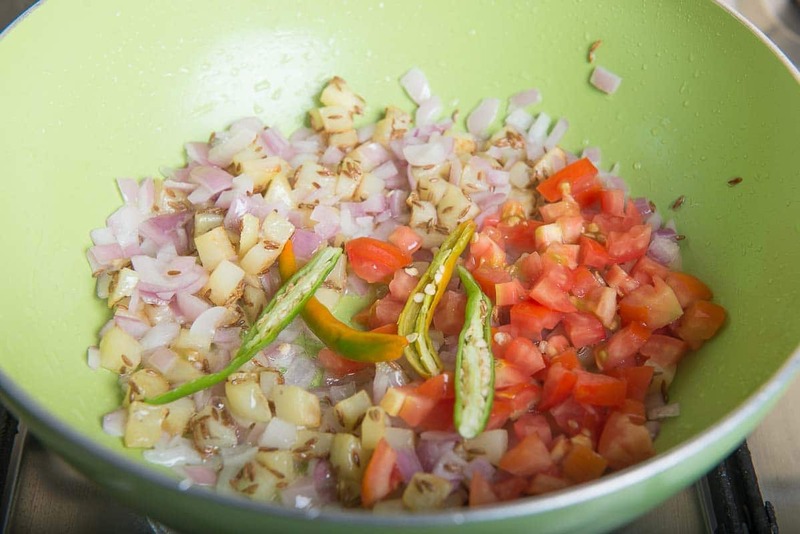 Add tomato and green chilli and cook for 3-4 minutes. Now add peanuts, turmeric powder, coriander and salt. Add soaked sabudana. Cook till sabudana turns translucent. Now add lemon juice. Garnish with fresh coriander and serve hot. 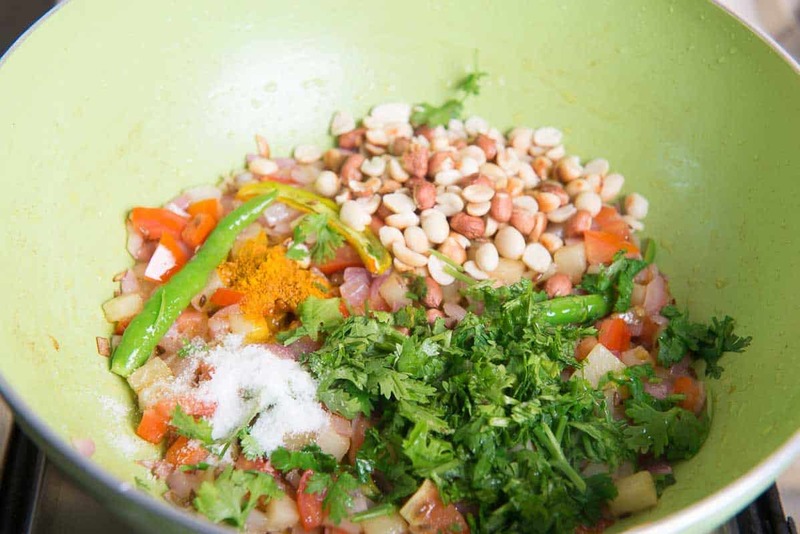 Now add peanuts, soaked sabudana, coriander and salt.